Its finished! I plyed the Guardians of Lipstick and the Fluff from Hell, and here it is! The picture came out a little darker and more purple than it is in real life. The skein is still a little wet so I haven't thwacked it yet. Apparently silk likes to be beaten a bit to bring out its shine and angora likes to beaten to make it fuzzy. I don't really know how merino and mohair feel, but they'll be beaten with the rest of the yarn. I just love how this yarn came out, even before the skein is "finished." I got 870 yards out of it and while I haven't checked wpi (wraps per inch) yet, it looks to be close to the size of Zephyr. I started with 2 ounces of the Kid Mohair/Angora and 2 ounces of the Merino/Bombyx Silk (Guardians of Fire was its real name). I haven't weighed the skein here because its not quite dry but I still have a good amount of the Guardians singles left over, so this skein is less than 4 ounces. I'll ply the leftover Guardian on itself and maybe use it to knit an edging on whatever I make from this. The colors should work since the Guardians make up half of this skein. I don't know what I'll make with it yet, maybe I'll design something new! I'm almost done with the dress. I just have to put in the zipper and do the facings and hem. Shouldn't take much longer. Pictures tomorrow! Look at the pretty kitty! 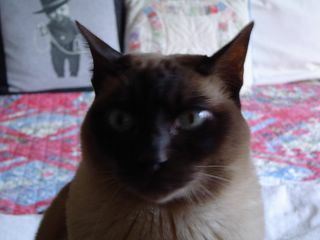 Yes, its one of those days where the Ultimate Blogging Accessory - The Cat - fills in for actual blog content. Poor Ramius looks like he's just been called upon to give an oral presentation to a group of small dogs. (For some reason Ramius doesn't like small dogs. Big dogs? Loves 'em. Small dogs? Not so much.) Basically its just the same old thing around here. I don't really have anything to show today because I haven't really gotten a lot done. Mickael is Best Man in a wedding this weekend so last night I started cutting out the dress I'm wearing. I figured I better get it started. I found shoes for it and knitted a wrap for it (the ivory feather and fan one I finished back in April) so I figured I better make a dress to go under it. Unfortunately, right now all I've got is the dress cut out and that's not very exciting. Yesterday, there were a couple of questions about the spinning so I'll answer them today. 1. Processed VM is a polite way to say poop. Poop as VM is very rare in processed roving. You will find it more often in raw fleece, but depending on how well the fleece has been skirted (removing the yucky parts and the coarse wool) you might not even find it there. The majority of VM that I've found has been grass and hay bits that naturally get on an uncoated sheep. They generally fall out during processing, predrafting and the actual spinning. 2. I haven't ever knitted with singles and I too spin them too much to leave them as singles. I've heard that if you spin at or below a 25 degree angle of twist on your singles, you won't have biasing. I've never tried this and I don't remember where I heard this, so I'm not guaranteeing that this will work. If you try it, let me know how it goes. 3. I don't own a Woolee Winder, but the Majacraft flyers have a sliding butterfly clip thingy rather than the 6 hooks like many of the other brands flyers. This allows me to have a little more control over how the bobbin winds on as I'm not stuck with 6 stationary hooks. Just a side note, for those of you that can tear your gaze away from Ramius, yes that's Buddy Lee on the pillow behind him. Mickael used to laugh himself senseless at the Buddy Lee commercials when they came out a few years ago. We found him a T-Shirt, but it was only a Large and was too small. I decided a year ago or so that it was silly to just have the shirt folded in the closet where it would just get hauled across the countryside everytime we moved, so I got it out and made it into a throw pillow as a surprise for Mickael. 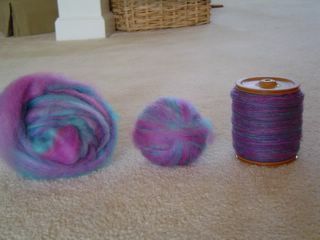 Ever wondered what the difference is between a roving and the singles yarn it produces? Well, here is one example. At the left you see the original roving with its large chunks of color. This roving has stripes of the colors that run the length of the roving (the Guardians of Lipstick had stripes of colors running crosswise to the length). I could have separated the colors and spun one after another or spun them up separately, or I could have spun the singles separately and then plied them together for a barberpole kind of look. Here I chose to keep all the colors running the length of the roving. You can see in the middle of the picture a little ball of predrafted roving. Predrafting is when you start to pull the roving lengthwise without pulling it apart. It loosens up any fibers that might be compacted or locked together from shipping or dying, it makes drafting at the wheel faster and more manageable, it helps me to spin a more even singles, and it will allow quite a bit of VM (Vegetable Matter for any non spinners - can be "processed" or "unprocessed" by the sheep) to fall out before you spin. On the bobbin (the thing on the right that you can barely see because its so full of singles) you can see what this roving looks like spun into a singles yarn. The colors are all still there, but instead of being large chunks of color, they are tiny dots and heathers. I finished the second bobbin last night so now they will age and then I will ply them together. I just loved spinning this roving despite the moderate amount of VM in it. I finished the sleeve redo! You can see them blocking here. In real life, my carpet is a little darker than the sleeves are but they look almost the same color here. After they dry out from their blocking, I will sew them into the sweater, and if they fit, I'll be done with it...again. 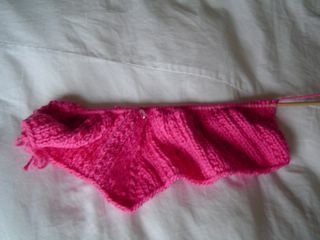 Then its back to some summer knitting. I'm still working on the Peep Tank and I have yarn for 3 more tank/shell type things. I'm going to try to stay on track with them, but I've started to think about some Fall knitting. I just love the cover sweater from Interweave Knits and I know I'll probably make it at some point. Right now, I only have the Peep Tank and the Seaweed Socks on the needles (I did the heel turn last night, so I'm almost done with those) so I could add another project and still be within my "No More Than 3 Projects on the Needles - Except Socks and they Don't Count" rule (its more of a guideline really). Ah, decisions, decisions. I think its time to dig through the stash and see what I want to do! I made my self a new purse for Summer! I found this really cute fabric with the women walking doggies on it and I knew it had to be paired with pink! What you can't see is that it is lined in the same pink and this is the first time I've ever put pockets into a lining. Mickael probably thought I'd lost my mind when he saw me measuring cell phones and lipstick tubes, but I figured if I wanted them to fit, I'd better actually measure what I wanted to put in the pockets. I don't know if I'll do pockets again - they were a pain in the patoot - but they are convenient. I guess whether or not I do pockets again depends on if I remember what a pain they are to do. This is where my being easily distracted and not remembering things will come in handy. 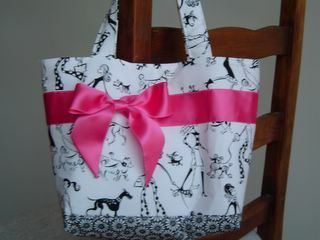 I made another purse just like this one for my sister in law, Mindy. Remember she had a birthday about a month ago? Yeah, I'm on top of things, I know. She lives in Dallas so I doubt that the purses will be seen together anytime soon. Mindy is one of my favorite people to victimize with things I've made. Our taste runs about the same, and while she does enough crafty things to appreciate them, she doesn't knit (I know, I know, but we all have these types in our families don't we? I mean we just keep loving them and hope that one day they will see the error of their ways). Remember the Loganberry roving from Wednesday? Well, I've already spun up 4 1/2 ounces of it, half of what I've bought. I've got a seriously full bobbin of singles (must remember to increase take up tension next time to wind bobbin tighter) and I'll probably start the second half of it today or tomorrow. I'm loving how fast this is going! 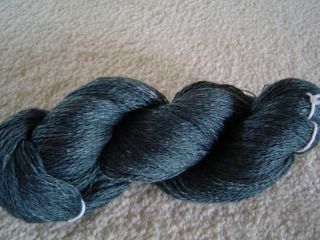 I think most of what I've spun on my wheel since I got it has been laceweight. This will be sportweight or so when its finished. I have roving for 2 sweaters waiting to be spun and I'll spin them at about this same weight so its nice to know that it goes so fast. Have a great weekend everyone! How many sleeves does this thing need? I've been reknitting some sleeves for a sweater I thought I had finished last November. I had sewn it up and tried it on when I realized that the sleeves were completely weird. 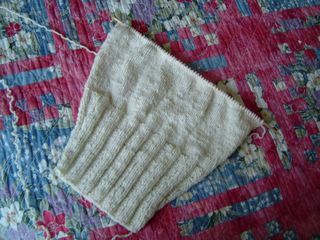 The ribbed part of the lower sleeve is 6 inches long and in the original pattern, they didn't start the increases until after the ribbing, which meant you had only about 9 or 10 inches to do all of the increases before you started sleeve cap shaping - and this is a pretty loose sweater. Naturally, it looked like leg-o-mutton sleeves which didn't look good at all. The sleeve cap shaping was also done strangely - they wanted me to bind off 2 stitches at the beginning of every row for like 30 times. The inside would have looked like stairsteps and would never have seamed nicely. I did tweak the sleeve cap shaping, but I didn't do it right, I just guessed, so the cap was also too tight which didn't help the overall look of the sweater. Once I realized I was going to need to redo the sleeves or I just wasn't going to wear it, I set the whole thing aside for a couple of months. I guess I had hoped that elves or something would come into the closet and fix it for me - they never do. So anyway, I pulled it out a while ago, took the sleeves off and frogged them, and now I'm reknitting them. Here's the kicker: I checked for errors in the pattern and there are none! I guess this is why the sweater is laying out by itself in the book, rather than being modeled. Also, the sleeve schematic in the pattern has nothing to do with the real sleeve pattern they give! So, I've rewritten the sleeve pattern with increases all up the sleeve and refigured the sleeve cap, which seems a little shallow as written anyway - even with all of the goofy bind offs. The pattern is the Tweedy Cashmere Pullover from A Knitter's Stash. Just from glancing at it, it has the look of something I could easily live in all winter, just an easy, relaxed sweater to toss on over a long sleeved tee and jeans. Nothing fussy, just simple to wear. Apparently not simple to make though. In case you're wondering, the yarn is Beaverslide Dry Goods wool yarn (they also have a wool/mohair) in Jersey Cream. So now that I'm redoing the sleeves, I'm about 3/4 of the way up to the sleeve cap shaping (the other sleeve is on the other needle, it looks the same as the one in the picture) which I hope to reach today. I'd love to get these done, blocked and back on the sweater next week. Then the sweater that I thought I'd finished last November will finally be done! 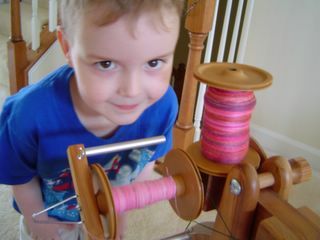 As you can see by the bobbin on the left, I finished the kid mohair and angora roving I dyed pale pink. I'm glad to have this done. I love the color and the softness is amazing but it was a pain to spin. Both Kid Mohair and Angora are slippery fibers and they really didn't want to behave themselves. Spinning this was the first time I've ever had the singles drift apart while spinning (not enough twist) and the end buried itself in the bobbin. The more you touch this silly stuff, the more it blooms - just gently rubbing your finger along the singles is enough to get it to start blooming (fluffing up into a glorious angora haze for all you non spinners). So, you can imagine how fun it was to find the end of the singles after it broke. I tried rubbing it gently in the opposite direction that it winds on, it got fuzzier. I tried gently using the sticky side of painter's tape to find the end, it got fuzzier. I was terrified that I would have to cut the singles just to find an end to finish spinning it, but I finally got lucky and by pulling one strand away from the bobbin, I just rewound the silly thing until I found the end. I have now decided that this bobbin full of singles will hereafter be known as Fluff from Hell. I think I'll take my Kid Mohair and Angora separate and mixed with a little wool from now on. 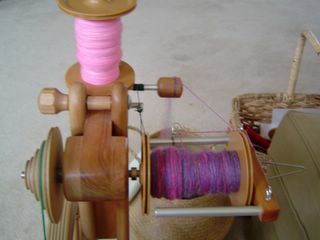 On the right side of the picture, on the bobbin, you can see that I've started spinning something else. 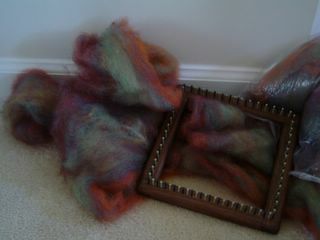 This is Border Leicester lamb's wool and mohair that I got from Kid Hollow Farm up at MDS&W. The color is Loganberry and it has turquoise, fuschia, purple, and kind of a mango color in it. It spins up very fast, and I'm really enjoying it after all the lace weight I've been spinning. I had only planned on spinning one bobbin of it (about 4 1/2 ounces) before I ply the Guardians of Lipstick with the Fluff from Hell (see above), but as fast as this is going, I don't think the Fluff from Hell singles will be dormant quite yet, I sure don't want to mess with them while they are active, I've had enough problems with them. The Seaweed Socks enjoy frolicking with a local flock of dolphins. 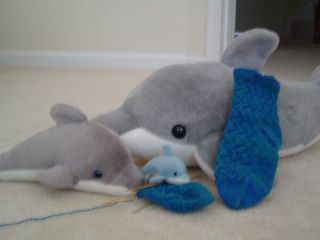 These are the rare Virginia Carpet Dolphins. 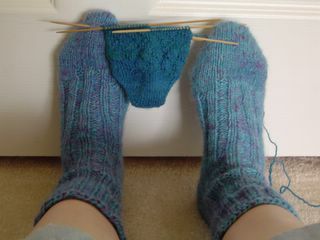 As you can see, I've finished one sock and have done a nice bit of the second sock. This is my swimming lesson knitting right now, and since the summer schedule is 4 times a week for swimming lessons, I should have these done in no time. In spinning news, I've almost finished spinning the pale pink kid mohair and angora that I will ply with the Guardians of Lipstick. I'll let the singles age for a bit before I ply them and in the meantime, I have some wool and mohair that I bought at MDS&W that I'll start on. Guess what that will be? Yeah, more socks. I'm going to have some seriously toasty toes this Winter. By the way, Happy Summer everyone! I'M BACK! Today we have blog show and tell! 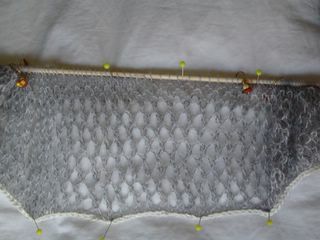 This is the first ever lace knitting I did. Its Birch from one of the Rowan fall magazines. Knit in Kidsilk Haze. The color is Poison, which unfortunately has been discontinued. 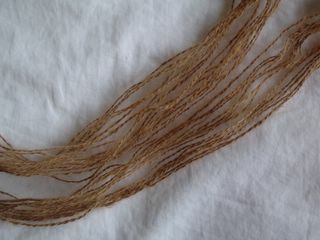 Its actually a little bit darker but the sun was shining on the silk core of the yarn, making it look lighter than it really is. I made this about a year or so ago, and I just love it! Poor thing could have used with a light steaming before its photo shoot. It got stacked under a linen wrap which is much heavier than it is. On the AC front, we have that problem sorted out which is why I'm blogging again. Mickael has been working the midnight shift so he needs to sleep during the day, and the only room in the house with a bed in it that's cool enough to sleep in has been the downstairs which is our guestroom/computer/workout room. I've been able to get online briefly every day, but after I sort out the 100 or so emails from the Mystery Stole group (more than 500 now! ), I just haven't had time to blog. 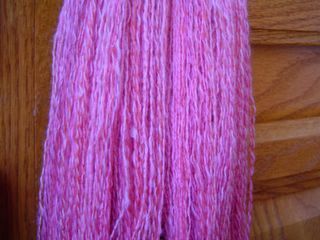 In knitting and spinning news, I finished the first of the seaweed socks and will start the second this weekend, I've been spinning on the pale pink kid mohair and angora, but you've seen that, its pink, its on a bobbin. I've also cast on for the front of my pink tank. Remember ages back, I finished the back of it? Its the bright pink of the pink Peeps at Easter? Well, with the Mystery Stole (kinda felt like I should finish that before the rest of the group, seeing as I was designing it), the front got pushed to the back burner, so now I can work on it. Fresh photos next week of everything. Have a great weekend! Last night I finished knitting the Mystery Stole! That's right, I'm leading about 500 people through a project that I hadn't even completed yet. Crazy, huh? Well, I'm happy to say that it worked, really, really well. I think its gorgeous and I really hope that everyone is happy with theirs when they get it finished. I got it blocked out on the floor and Ramius, who thinks alpaca is yummy, didn't even eat it. As soon as it was dry this morning, I unpinned it and got it put away. No reason to take chances! For obvious reasons, there is no picture today. In completely non knitting news, the heat pump/AC thingy (can you tell I'm not in HVAC repair?) went belly up last night. Fortunately, we have another AC unit that works, but this one is for the downstairs two levels. The broken one is for the bedroom level and the loft. The cat is loving the whole sauna effect, but I think we might be moving downstairs for a couple of nights since the repairman can't come until Thursday afternoon. It should be under warranty as the house is less than 2 years old. I told Caleb we might be sleeping downstairs tonight, and as he's resistant to change (aren't most men), he got really upset. Then I told him we could camp out and that made it all OK. Its all in how you package it, I guess. This weekend I played with my Hazel Rose Loom. I used my first ever handspun yarn, figuring if I got it out and used it, it would be happier in a square than living in the back of one of my stash cubbies. I have soaked the square after weaving it here and just patted it back into shape but I haven't ironed it yet. I'm pretty happy with it. This is the first time I've woven anything since my potholder days as a kid and I didn't do very many of them. I know there are places where I've pulled the yarn tighter than other places, but I figure I'll get better at that with some practice. In other news, I will have my version of the Mystery Stole off the needles tonight! Its been a really fun project and I hope that all the Mystery Stole Alongers (498 this morning!) are having fun with it too. I can't even begin to explain how much I've learned doing this thing. I look back now at how I thought it would go, what I would have to do, and the size I imagined it being (10-20 or so - HA!) and I realize that I had no idea what I was getting myself into. On the other hand, if I had known then what I would be learning, I probably would have chickened out and not done it. Being completely in the dark does have advantages! The Seaweed Sock is marching on nicely. 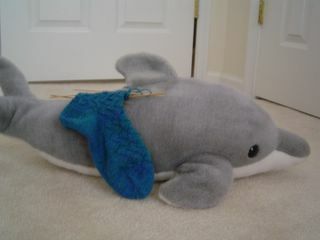 As it swims with a friendly dolphin (we do too have dolphins in Northern Virginia), you can see that I've done the heel turn and a couple of inches up the leg. 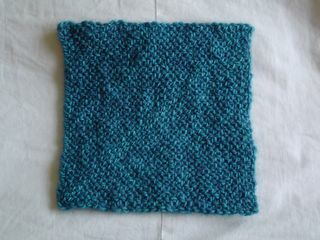 This is a really fast knit and I think its because of the stitch pattern. I know what its going to do, I mean its just going back and forth, but I keep going just in case it does something different. I'll probably get back on this today just for an easy, no brainer knit. Today I attempted to post the second step for the Mystery Stole and its been high drama ever since. Somewhere between my computer and the group's site at Yahoo, the file was getting all messed up. Charts were really tall (kinda like they were silly putty) and missing parts - not good at all. It ended up being uploaded by someone else, who had gotten a good download while I was fighting with it, but I just found out that someone got an entire chart without any symbols. I'm just wondering what else will go wrong with this silly thing. My computer seems bound and determined to take over the whole project and redo it differently. The problem with this is, the computer doesn't knit! I'm going to go find some chocolate, yeah, I know its only 9:15 in the morning. My name is Melanie and I'm an addict...and I don't plan on doing a thing about it. This is Chiengora from our late Golden Retriever, Bear. Spin Off magazine is looking for reader's skeins of doggy fleece or blends with doggy fleece, so I'm going to send this in to them. I also have a little more than half a pound of Bear's fleece blended with Merino and Tussah silk that I had professionally processed into roving. 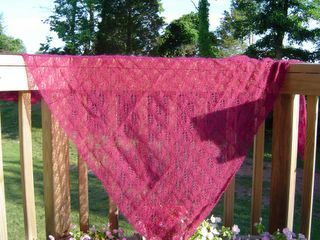 I plan to spin it later this summer to make a shawl out of. Got some new goodies over the weekend! This is 8 ounces of a Romney/Mohair blend from Linden Lane Farm. I think it will make some gorgeous Fall sockies. This is a beautifully made roving. Out of the 4 feet or so that I pulled out of the bag for this shot, I only found 1 tiny piece of VM! It's so light and fluffy and perfectly blended. You can also see my new 7 inch Walnut Hazel Rose Loom reclining gracefully on the roving. That's right, you guys didn't talk me out of it so there it is. Its absolutely beautiful. One of those tools that is a work of art by itself. I can't wait to play with it. I also got a scale finally. I figure it might help me keep my spinning more even and I've needed one for a while to figure out how much of a roving to pull off if I want to dye some of it but not all. I'm really trying to learn how to spin a consistent yarn. I do pretty well at the laceweight gauge but I've got some roving I want to knit into sweaters and quite frankly, I don't want to knit laceweight sweaters. I'm afraid I'll start out spinning where I want the yarn to be but will then gradually decrease back to laceweight which would change my gauge in the middle of a sweater. So, I figure I've been spinning intuitively for almost a year now, it wouldn't hurt to learn something more technical about spinning so that I can spin for reproducible results. I figure if I learn how to do that, I can spin some yarn to exact specifications for larger sweater like projects but still spin by the seat of my pants when I want to. I've been spinning this in the evening after Caleb goes to bed and I've discovered that Ramius does a really good job of policing Caleb. The other night I was spinning and watching TV while Caleb was "in bed" and all of a sudden the cat went to the bottom of the stairs and started yelling (he's a Tonkinese, he doesn't mew, he hollers). I wondered what was going on but didn't think anything at first since the cat regularly has "fits" that involve running and jumping all over the house while yelling at the top of his lungs for 30-45 minutes. Then I realized that Ramius was just sitting there, not running and jumping around. On a hunch, I looked over and told the cat to stop yelling at Caleb and would you believe it? Sure enough, I heard little feet go running back up the stairs and trot into his room, closing the door. The little monster was sitting on the landing watching TV but he was sitting where I couldn't see him. Thankfully, Ramius was on top of things. See, I haven't forgotten it! Guess what? As you can see the blog has a new look. I had emailed Christine, who did the button for our Mystery Stole Along and knows lots of things about computers and HTML about my blog template. The sidebar was crashing into the main post area and I didn't know why. Not only did she figure out why (Pink Kitty was causing problems), she gave me more pixels and did a blog makeover! Check out the new sleeker title. Look, a sparkly clean sidebar! Spring cleaning on the blog! Gotta love it. The downside? Now I know how to change colors and maybe even fonts (haven't tried messing with the fonts but I've already tweaked the colors) by myself (with only 30 or so emails to Christine). Look out blog readers, I can now change things anytime my easily distracted little mind wants to! BWHA HA HA HA! I finished the lazy socks! 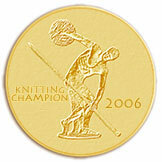 Just to recap, they were a spindle spun 3 ply of Romney lamb's wool and alpaca. I dyed the singles individually before I plyed the yarn (teal, royal blue, and violet by Wilton's). FYI, if the sock on the left looks more purple or blue, that's because the teal singles in that yarn was a little finer than the teal singles in the right sock's yarn. I'm OK with not quite identical socks, if I wanted identical, I could buy them. Just one of the joys of handspun! As you can see, the lazy socks are holding the beginnings of another pair of socks. These are also handspun. The yarn is a 3 ply of Gulf Coast Native Improved (GCNI) and mohair. The wool is dyed a royal blue and the mohair is a Kelly green so when its spun together, it makes all kinds of blues and greens and yeah, you guessed it, blue greens! Its called Oceania and its from Running Moon Farm. 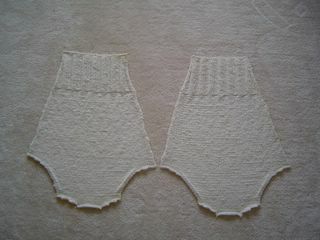 I'm doing a wiggly line pattern of purl stitches on the instep and will continue it in the cuffs. Its supposed to look kinda like seaweed or ocean currents so I will call these socks the Seaweed Socks. I'm always amazed at how amused I am with knitting a stitch pattern. Even when I know what its going to look like, its so much fun to knit while I watch the pattern develop on whatever it is I'm working on. I know part of it has to do with me being easily amused. We won't even get into how much fun I have with varigated yarns and tweedy yarns. The sock is growing. I'm about halfway done with the cuff although I have no idea how. The sock seems to just lie around in the hammock all day. I'm glad its almost finished, seeing as I have yarn for two more pairs already spun and roving for 3 or 4 more pairs here in the house. That's not counting the roving in the mail that I just had processed from Wooly Knob Fiber Mill that's another 4 or 5 socks. I will have some seriously toasty tootsies this Winter! I plan on making Caleb some socks from some of this and Mickael will get some if he wants them too. There has been some discussion on Spindler's list lately about sock making so here's my two cents. I make toe up style socks because I detest Kitchener Stitch. I avoid it like the plague and when I'm forced to do it, its not pretty. I basically use the measuring technique from Wendy's Generic Toe Up pattern, but instead of the short row toe she gives in the pattern, I use the Easy Toe which you can find in her Knitty article here. I have my own little variations and tweaks that I've figured out that make it easier for me to fit my own feet, but these two sites will get you on your way to toe up socks. I do use a short row heel on my socks that gives the little diagonal line you find on commercial socks. I like the way this feels more than the feel of a heel flap. 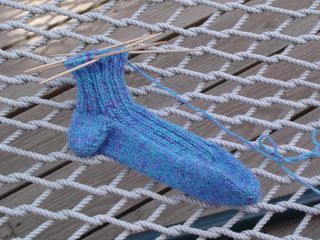 I don't use a wooly nylon or sock reinforcement knit along on the heel or toe and I haven't found that I'm wearing through my socks without it. The roving that is coming from Wooly Knob does have some mohair added to it for extra strength. I've heard that mohair wears like iron and will really strengthen socks. I like mohair enough that I don't mind adding a little whether this is true or not.